I adore children’s picture books but I have not had much experience with children’s novel illustrations. 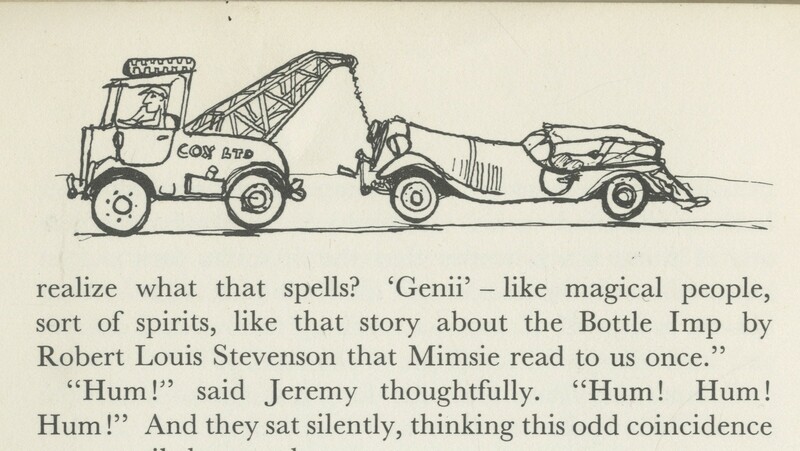 One brilliant example of this genre is ‘Chitty Chitty Bang Bang the Magical Car’ by Ian Flemming and illustrated by John Burningham. Childrens novels are aimed at children aged between 9 and 12, so the illustrations have to be mature enough to appeal to the older children but at the same time still be exciting enough to engage them. 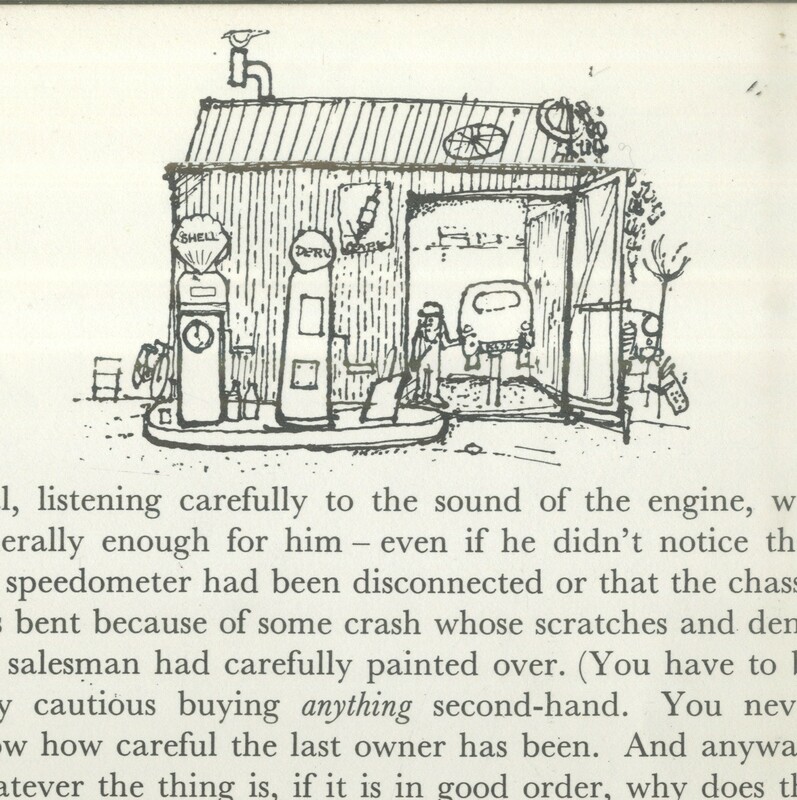 John Burningham does this extremely well through his interesting and expressive illustrations. The cover of the book reminds me of modernist poster with the bright, bold colours and asymmetrical compostition. The typography and layout is also very modernist and simple. I love the wrap around illustration and how the car continues round onto the back.This stylized illustrations is true throughout the book. Throughout the novel Burningham uses both spot illustrations and double page spreads where appropriate in relation to the text. The main media used is ink which he applies very freely yet still with consideration. He uses different mark making to create texture and atmosphere. The majority of the spot illustrations are in black and white, but Burningham uses colour in various ways in the double spreads. In some illustrations he uses spot colour and applies it is different ways. This can clearly be seen in the illustration here. The tone of the green changes as well as how the colour is applied; flat or textured. This creates a very dynamic and textural image that works well with the subject if the garage. Collage is also a technique that is very prominent in Burninghams work. He uses tinted black and white photographs to build on top off with drawings and paint. I think the collage is really effective and interesting and adds another dimension to the illustrations. The inclusion of the photographs makes the illustrations more grown up which would appeal to the audience of older children. There is one page where there is no text and the open page is a double spread illustration. These variations in the size and format of the illustrations make it an engaging book to read as every page is different so keeps the young reader interested. I really like John Burninghams illustrations and think they are very appropriate for the story and audience. His combination of photos and drawings is very interesting and he manages to bridge the gap between the two very subtly and with great style. Next Post Basic and Sumberac’s ‘Snow White’.